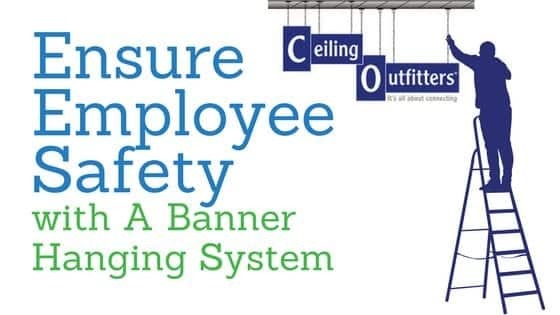 Most business owners and managers are a bit puzzled as to how to easily hang a ceiling banner. Hanging a banner that draws attention and highlights a product, message, presentation or event in a persuasive manner is undoubtedly a challenge. The solution has arrived in the form of our Essential Banner Hanging Kit. Retail stores, banks, restaurants and other businesses hang and change signs, banners and other ceiling displays throughout the year. 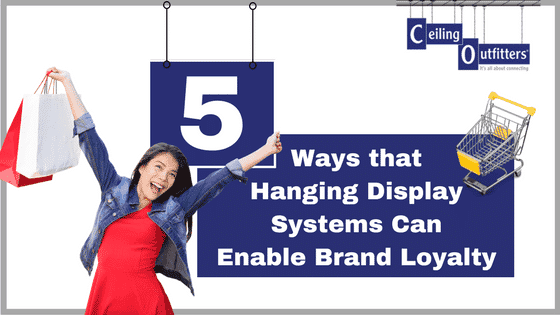 Without the proper tools and hardware at your disposal, hanging a banner, sign, graphic or other ceiling display can quickly turn into a time-consuming and frustrating ordeal. Consider the time taken to gather together parts to hang a sign only to step back and see it is lop-sided. Or, within hours the sign falls to the ground. Think about the time taken to mount a graphic on the wall only to discover the sign is rarely noticed because it is not easily read at a distance. Customers notice signs and banners that are centralized and prominently displayed in close proximity to featured products, pallet displays or mirror the traffic flow pattern of the business. 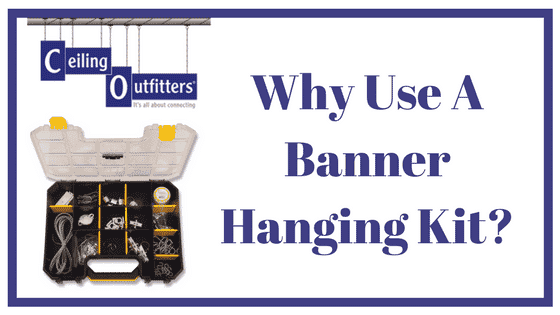 The bottom line is to successfully hang banner you need the right tools. FomeCor®. Permanent signs are made from heavier materials and require heavy-duty hardware. The type of ceiling is important. 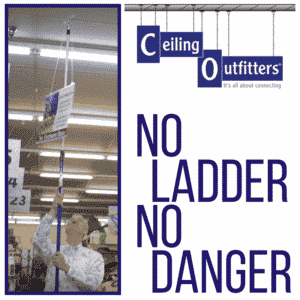 Drop or suspended ceilings should only support signs that weigh 3 lbs. or less. 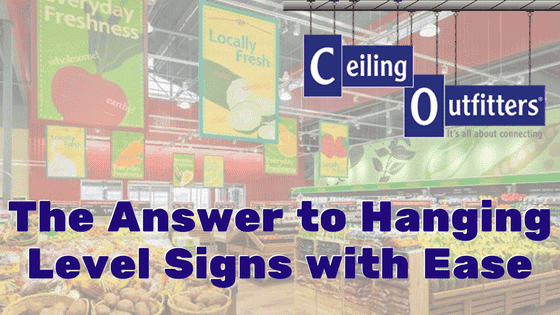 Open beam ceilings (aka rafters) support heavier signs. The Essentials Banner Hanging Kit includes hardware for both situations. We have gone to great lengths to develop a banner hanging kit with everything a business owner, manager or installer needs to hang a few signs or banners. When searching for the right hardware for an easy, secure and effective way to hang a banner or sign, look no further than this banner hanging kit. It simplifies the challenges of sign hanging projects. Give our pre-packaged banner hanging kit a try and simplify all your future sign hanging projects! This kit is loaded with everything needed to hang light weight temporary P-O-P sign or a heavier weight permanent sign. These are the exact supplies necessary to solve the many challenges involved with visibly and securely hanging a banner or sign. 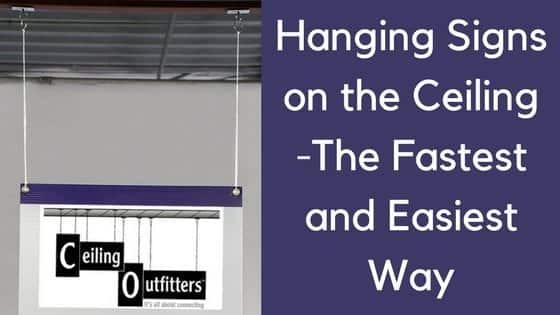 Whether looking to hang a sign in your store, make use of a ceiling display or hang a banner to welcome guests, our convenient Essentials Banner Hanging Kit will make it surprisingly quick easy. The banner hanging kit is packaged in a robust carry case designed with adjustable compartments. Put it in your truck, storage closet or elsewhere without having to worry about it breaking or being compromised. The case measures 17.375″ x 13″ x 3.5″. Open it to find an array of banner and sign hanging hardware ranging from “S” hooks to a 1/16-inch 20-foot-long steel cable, Mini ClikMagnets, various strength ClikMagnets™, LoopLine™, window frame metal plates, a 1/16-inch aluminum sleeve, U-hooks, ceiling hooks and clips plus so much more.